Translated title: La belle dam sans mercie; This painting is probably one of Waterhouse's more famous images. Translated in English as 'The Beautiful Woman Without Mercy,' this painting depicts a woman ensnaring a knight in the forest, drawing him towards her with her hair. The knight, totally enraptured by her beauty stares into her eyes hopelessly. 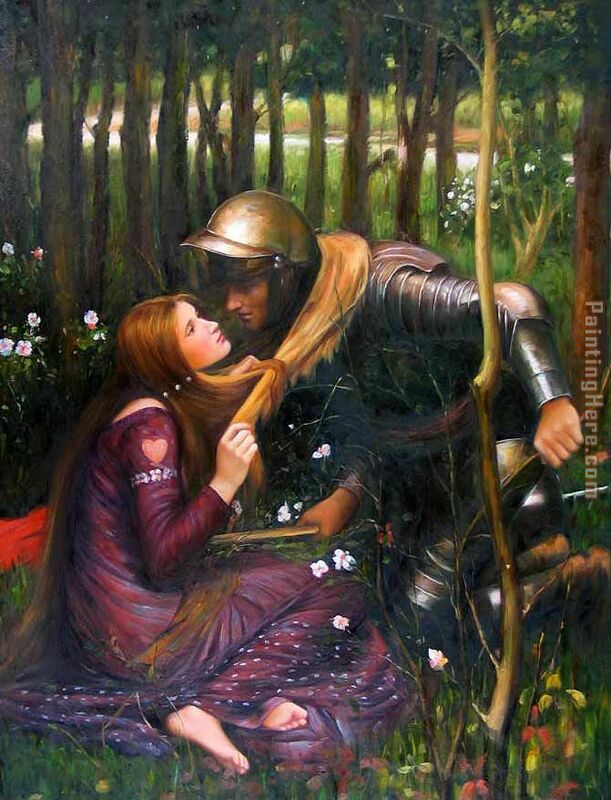 As Peter Trippi, world expert on Waterhouse, points out in his catalog resume: "This picture owes its intensity not only to the seductive gaze from the lady’s eye, but also the figures’ expressive juxtaposition.” Trippi also says that La Belle Dame Sans Merci is a result of the “fascination with the hypnotic power of beauty.” The title of this piece derives from a poem by Keats first published in 1820, in which a knight is bewitched by a fairy in a meadow, almost costing him his life. (Resume on J.W. Waterhouse) La Belle Dam Sans Mercie is a common theme depicted in many Victorian paintings of a woman using her beauty to entrap men, putting them at great peril. It is truly an amazing work of art. Beautiful, original hand-painted artwork in your home. Interpreted paintings based on the masters' works of John William Waterhouse.This The Beautiful Woman Without Mercy needs about 14 - 16days for production by a talented artist. If you're not happy with John William Waterhouse The Beautiful Woman Without Mercy that you made on PaintingHere.com, for any reason, you can return it to us within 50 days of the order date. As soon as it arrives, we'll issue a full refund for the entire purchase price. Please note - PaintingHere.com does not reimburse the outgoing or return shipping charges unless the return is due to a defect in quality. If you want to purchase museum quality The Beautiful Woman Without Mercy at discount price, why not give us a try? You will save a lot more! This John William Waterhouse The Beautiful Woman Without Mercy needs 14 -18 days for production time frame. We ship all over the world. We can provide The Beautiful Woman Without Mercy Painting stretched canvas and large framed art.